Defying the passage of years? Throughout the 1950s, copyright dates appeared on all Vogue patterns (or, at least that has been my observation). Copyright dates appear on some of the patterns from 1960-‘62, but after that, they are non-existent. It is always a thrill when I find a reference to, or picture of, a pattern, which I own or am working on, in one of The Conde Nast Publications, Inc. magazines or other printed materials. It is one sure way to date an otherwise undated vintage Vogue pattern. 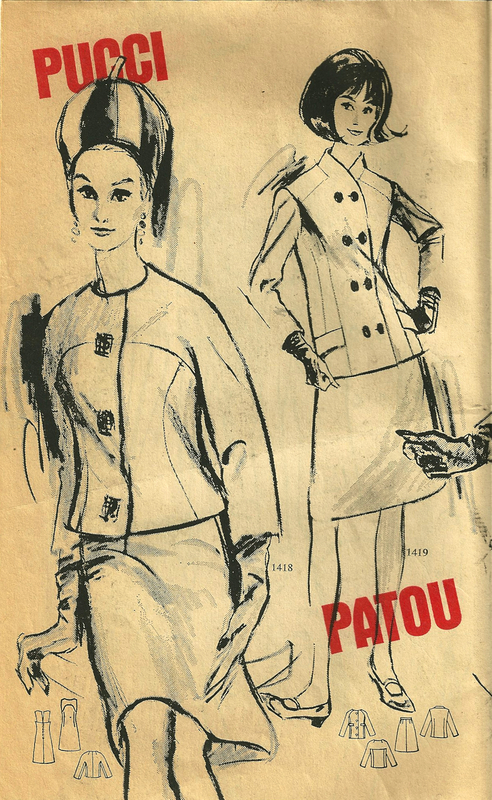 So – you can imagine my delight when a small, 8-page Vogue Pattern Fashion News from February 1965 – which I recently purchased – featured the Emilio Pucci dress and jacket which has been my sewing focus for the past several weeks. 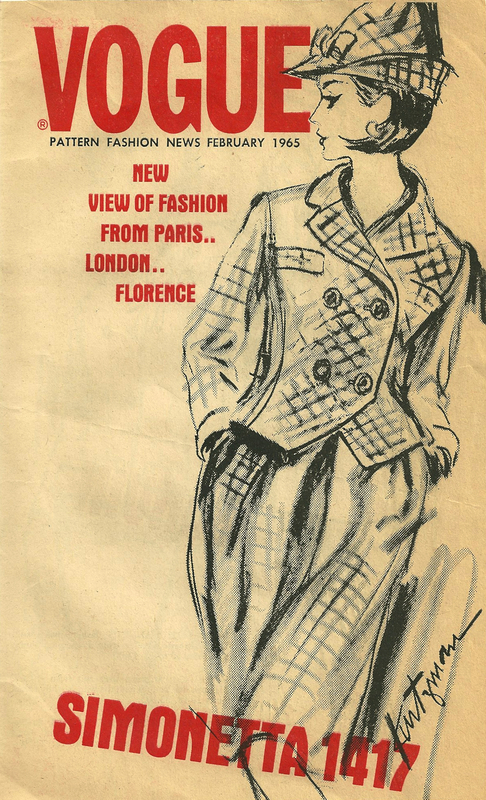 On the cover of this small “flyer”, which was available for pick-up wherever Vogue patterns were sold, is the reference to fashion from Florence – as in Pucci’s Florence! And here is the sketch of “my” Pucci pattern. And – I did indeed wear this dress (and jacket) to an “important party” just last weekend – to a beautiful wedding in Center City Philadelphia. First, I can tell you I was delighted that the pieced sleeve linings worked just as I had hoped they would. 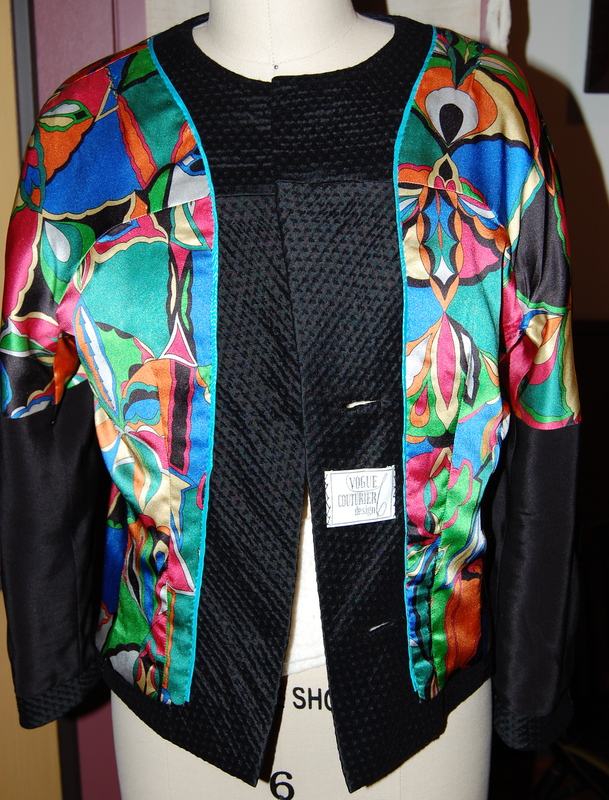 Here is the jacket turned inside out, showing the piecing on the lower sleeves. Inside out, a back view. 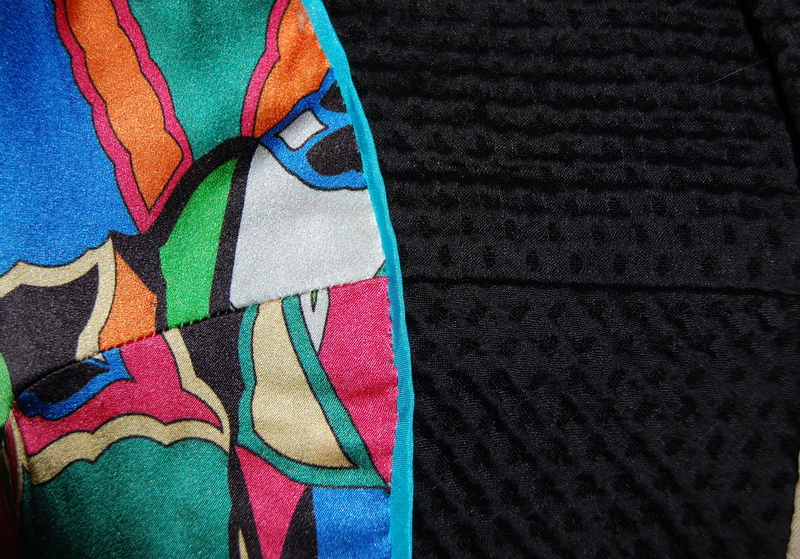 And here is a photo inside the jacket, looking towards one sleeve, which shows that the piecing does not show! Hurray. I honestly don’t think anyone seeing the jacket slung over a chair is ever going to suspect that the Pucci lining fabric does not extend all the way down the sleeves. I also had the idea to add a narrow, bias, flat piping to the edge of the lining down the fronts and around the neckline. I found a turquoise silk in my fabric closet which seemed to keep with my “theme” of the turquoise under-stitching on the interior of the dress. This is one of those “dressmaker details” which just makes me happy. Another thing that makes me happy are the buttons! I picked out specific scraps of the silk, which featured designs I wanted to emphasize on the buttons. 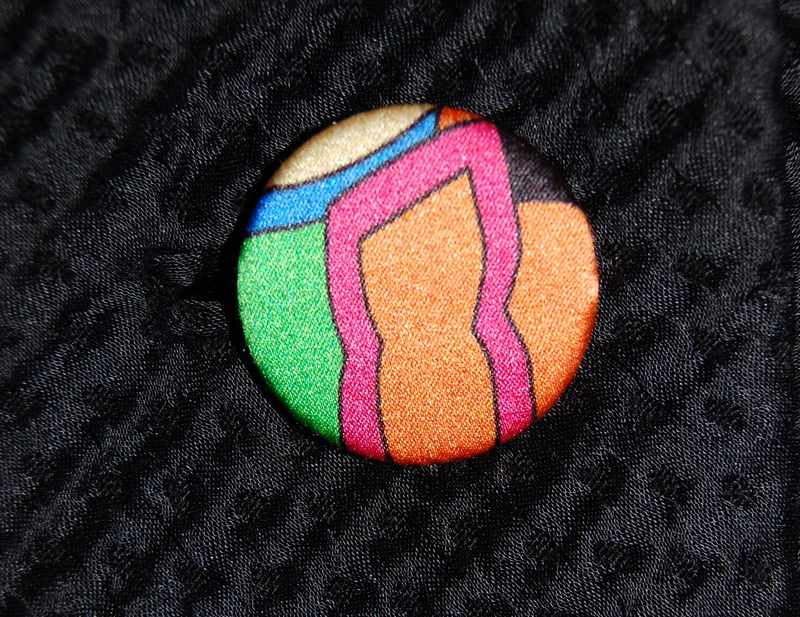 I sent them off to Pat Mahoney in Lodi, California, who returned them made into 1¼ inch buttons – flat and beautiful! 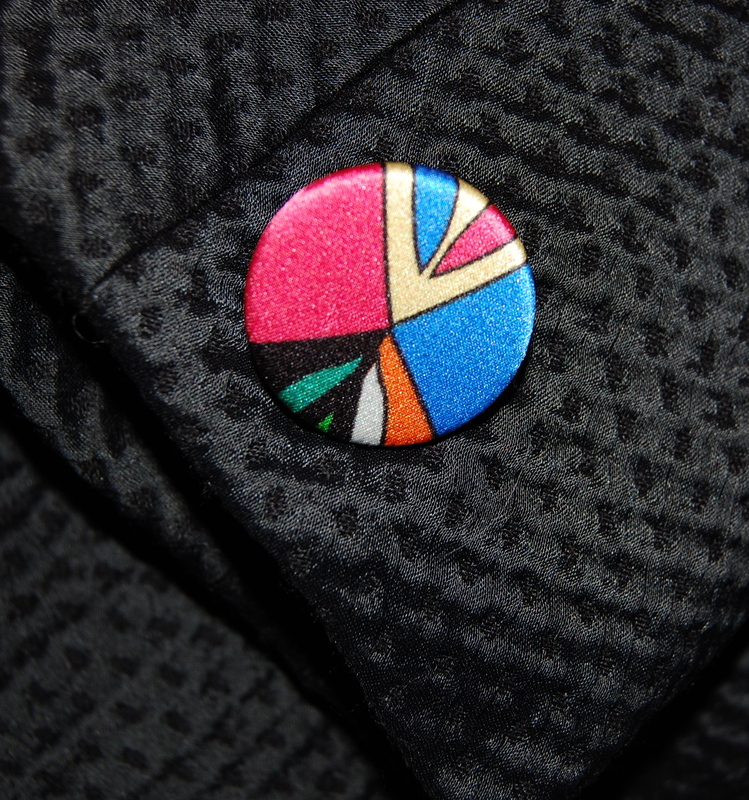 This is the button I chose for the top of the jacket. Notice the slot-seam-buttonhole. 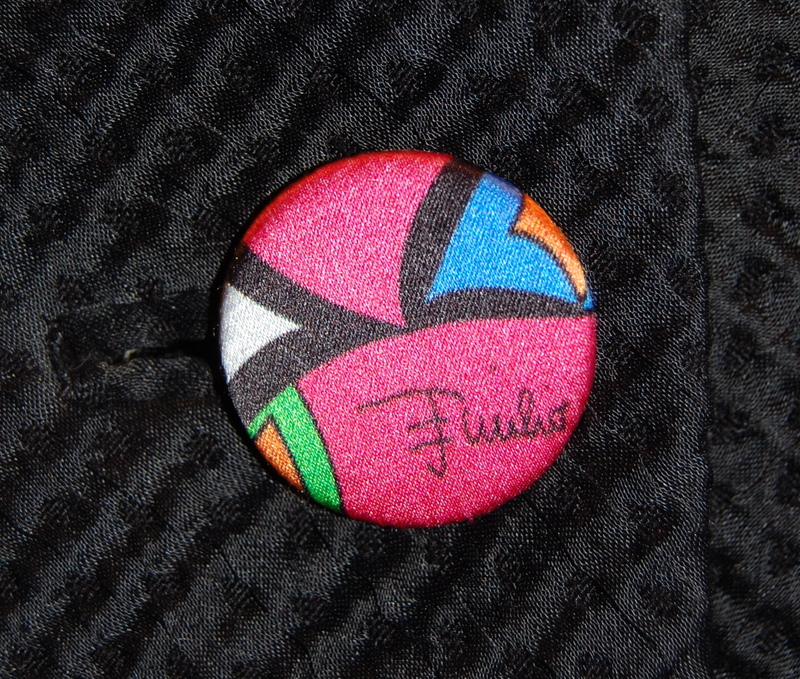 The middle button – I couldn’t resist featuring the Emilio signature on this one. 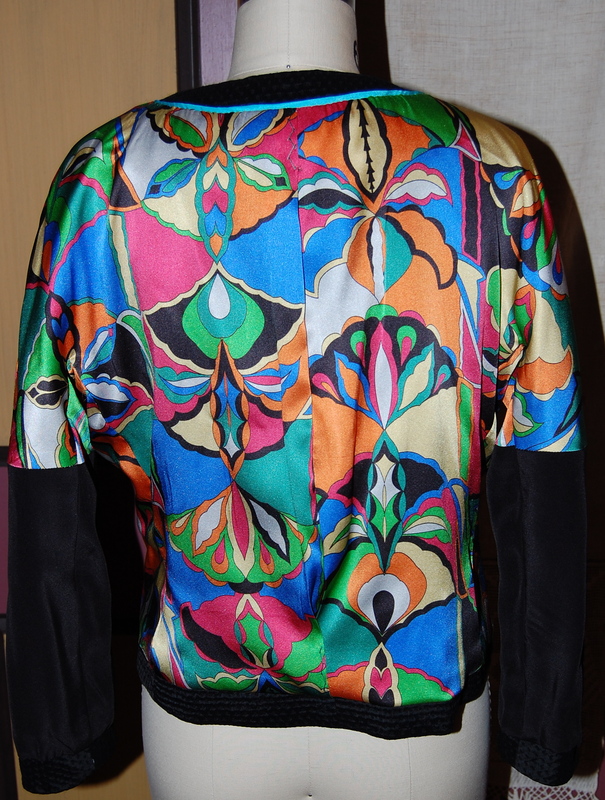 I had the jacket finished when I suddenly remembered that a Vogue label had come with the pattern. Of course, I was delighted to sew it in place. There is something about using a pattern from 1965 that seems quite amazing to me. Yes, it is simple math, but think about this: 1965 was 49 years ago! 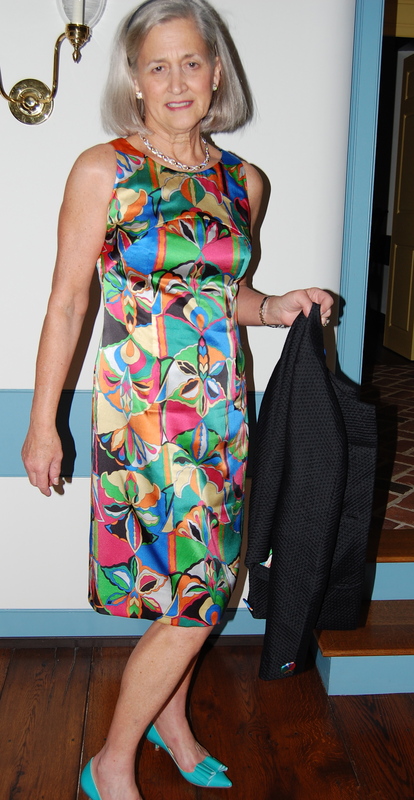 Is anyone who sees me in this dress and jacket going to think that it is sewn from a 49-year-old pattern? Somehow I doubt it. I think my secret is safe. Congratulations on completing your couturier work of art-to-wear. It is exquisite in every detail. What a splendid accomplishment! It is one thing to sew ordinary items of clothing, and quite another to execute a high fashion design in precisely the right fabric, with couture methods. Thank you for sharing the journey with us, your loyal readers. Thank you, Ann. I’m so glad you were along for the journey, and I so appreciate your comment. What a beautiful outfit – executed flawlessly. I love the genuinely personal touches such as the buttons and turquoise binding. It is genuinely timeless. Congratulations. Thank you! It’s difficult to go wrong after starting with a wonderful pattern and beautiful fabrics. Spectacular!!! Worth every moment of your time can’t waitbtobsee what’s next from your atalier! Thanks, Cissie. And you KNOW there is more coming from my sewing room, but next up is a small change of pace! Stunning ensemble,,I particularly like the buttons on the sleeves.. Thank you, Pamela! 1950 was wonderful year to be born. We were old enough to remember the great fashion explosion in the ’50s, and of course the stylish ’60s and early ’70s. It is so much fun to recreate those looks and have them still be so current. I am so glad you are enjoying my blog! Very, very nice. Wonderful work. 49 years ago, gosh I feel old since I remember 1965! Thank you, Sueann! 49 years does sound like a long time ago, doesn’t it? But let’s just call ourselves smarter, not older!! Thanks, Jackie! What a lovely comment! Brava! Your attention to those designer touches is inspiring — and the buttons pull it all together. I don’t think I’ve ever even considered how my jacket would look when hanging on a chair, but yours is impeccable. That’s what I mean by inspiring. Thank you for sharing this experience with us. Thanks for following along! I love a pretty “insides” when it comes to jackets, particularly, and I always think the extra requirement of time is worth the finished product. By the way, I really enjoy your blog – and all the research that goes into it! What a stunning result! I just love the buttons, and the turquoise piping. Lovely! Thanks, Lizzie! All those small scraps and lengths of fabric I hold onto come in handy for details such as the piping. Quite simply stunning. The colours in the fabric look gorgeous on you, and it’s a divinely classic and flattering look! 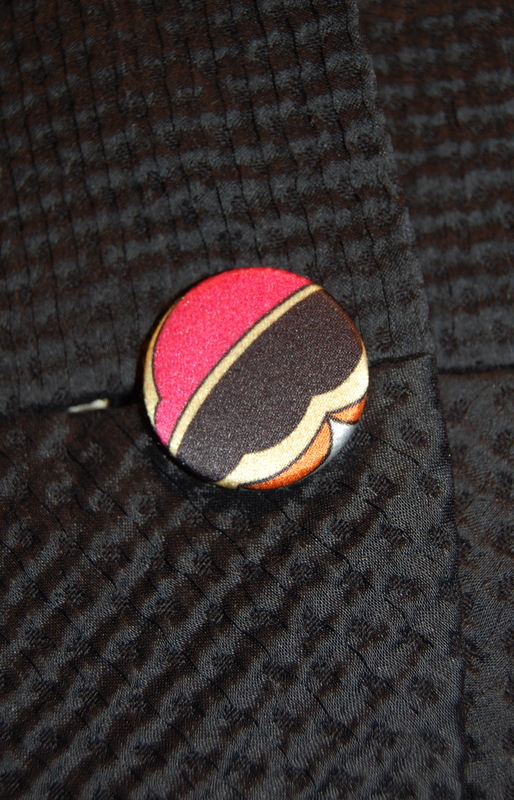 Your buttons and the jacket lining piping make smile – I love those little details. You’ve also solved a bit of a mystery to me – I’ve got 5 meters of what I thought was a pucci print in my stash, but had no way of knowing, until you mentioned the little signature! And I adore your shoes – the colour and the heel height! You look absolutely wonderful! Thank you for your lovely, lovely comment! 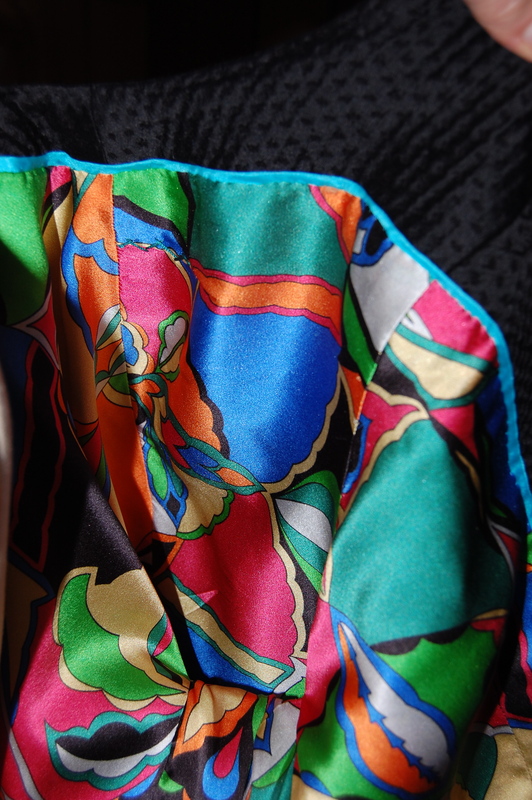 So, I am anxious to know – is your fabric a Pucci? It is, yes! It’s not the usual pucci mediterranean colour palette though – it’s caramels, reds, yellows and creams. 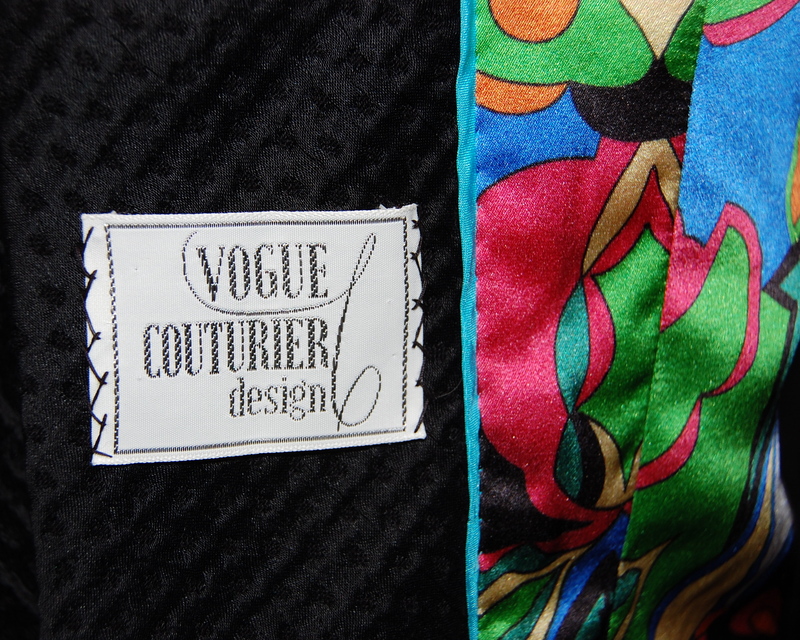 And now you’ve introduced me to the wonderful world of Vogue Couturier patterns… I’ve got my eye on a few. Thanks for the inspiration! Thanks, Brooke! This was such fun to make, and working with beautiful fabrics made it even more so! Hello. Your outfit is beautiful, such lovely colours. I love your “dressmaker details”, regardless that they are not on show they finish the outfit and make a sewist happy. Thank you! I always think the little extra details make such an outfit just that much more “personal” – and fun to wear! Looks fantastic! You’re going to have a ball wearing that. Thank you! I know I will be able to wear this dress and jacket often – and it is so rewarding to wear something of one’s own devising, isn’t it? Gorgoeus! I love it! It is timeless, elegant, fabulous! 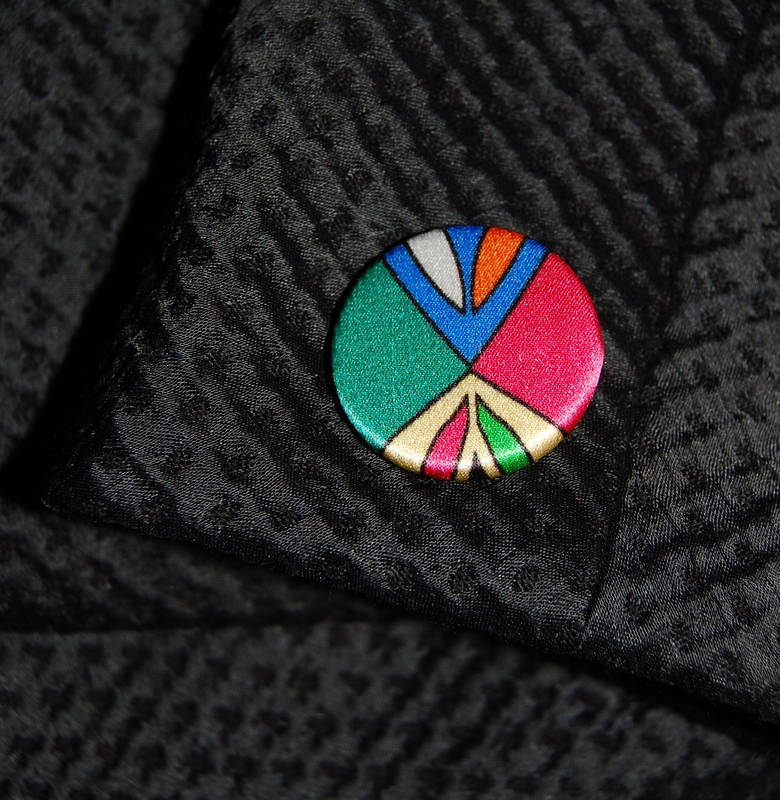 The covered buttons are the final professional touch! Very beautiful! Thank you! I decided no other buttons would do for this – and it is so wonderful to have Pat Mahoney services available for a project like this. Thanks so much for your comment.